Salmon En Papilotte makes me laugh. When you tell someone, "I think I'm going to make Salmon En Papilotte" tonight, you'll usually get in return a wide-eyed stare of wonderment and curiosity. That's right. You've just impressed someone by using a fancy way to say "I'm going to cook something in paper." I tested this theory by making this my status update on Facebook a few days ago. I received comments such as "Oooooh, what's that?" and "When is your cookbook coming out?" It's kind of like saying, "Where is the bathroom?" in a foreign language. In English, it's not that hot. But when you say "Dove il gabinetto? ", it's like angels singing. If you want this particular recipe, purchase The Gourmet Cookbook (a fantastic book with over 1,000 recipes!) I have to respect the book publishers and not publish this recipe online! The Kitchn has a great series of tips for grilling the perfect steak. Now, I know grilling season is over, but if any of you are lucky enough to have an indoor grill pan where you can very easily almost burn down your apartment, then you'll find this useful all year round. 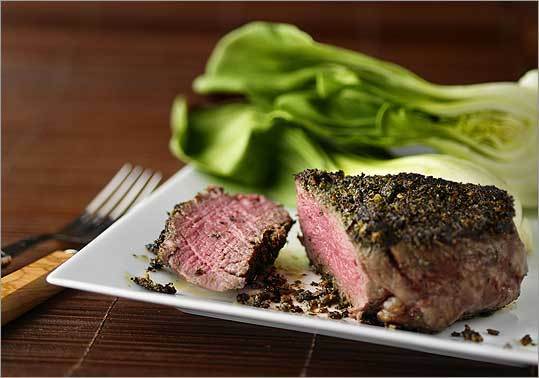 For bold flavor and peace of mind look for grass-fed, grain-finished steaks from the rib or short loin. 2. Bring your steak to room temperature before grilling. It'll cook faster and stay juicy. Salt your steak before you put it on the grill, and again before serving. 4. 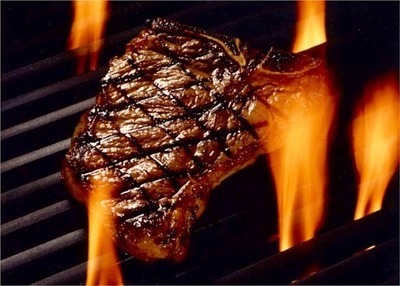 Before you grill, make sure the steak is dry and lightly oiled. 5. Sear the steak over high heat, then cook gently to finish. Grill over intense heat for 3-5 minutes per side, then move the meat to a cooler spot on the grill to cook it through. Use a meat thermometer and aim for between 125°-130° F. for rare, 130°-135° F. for medium. After you pull it off the grill, let the steak rest for 5 minutes before serving. Set the steak on a plate in an 170 F. oven, or tent it with foil on the counter. Plain sweet butter or – even better -- a composed butter of shallots and chopped herbs makes any steak taste better. Helpful tips for cooking are always great. I don't want the picture below to be the first thing that pops up on your (and my) screen. Yuck. There is nothing better than a light, fluffy pancake. Cooks Illustrated gives some great tips on how to make the perfect pancake. Go ahead. Try it. Impress your loved ones. Mix the Batter Lightly. There are two factors that promote fluffiness in pancake batter, underdeveloped gluten and dissolved baking soda. Gluten is a mix of very long proteins that are disorganized in structure. Once gluten is dissolved in water, these proteins can more easily rearrange their structure. Kneading or mixing gluten elongates the proteins and somewhat organizes them, an action similar to combing the strands of your hair. As the proteins start to lie more or less parallel to each other, the dough becomes elastic and less tender. By reducing the mixing time of your batter, you give the gluten less opportunity to organize. Baking soda (either on its own or as part of the baking powder formula) creates the bubbles that make pancakes rise. When baking soda encounters an acid, carbon dioxide is formed to produce the bubbles in the batter. The stirring of the pancake batter speeds bubble formation by moving the baking soda and acid together. 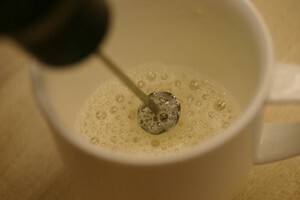 Unfortunately, stirring also causes the release of carbon dioxide gas by bringing formed bubbles to the surface of the mixture. Just a little too much stirring and the bubble-forming capacity of the baking soda will be quickly exhausted. To make the fluffiest pancakes possible, then, you should stir the batter until the ingredients are just incorporated—and not one stir more! Use the Batter Within an Hour. To determine how far in advance we could make pancake batter, we mixed up a few batches of basic pancake batter and held them for different lengths of time before cooking: one hour, two hours, and three hours. Holding the batter for one hour had no detrimental effect on the pancakes. After two and three hours, however, the batter spread out too easily, producing thin, floppy cakes that were much less appealing than the ones made from fresh batter. Here’s why: In fresh pancake batter, baking powder reacts quickly, releasing most of its gas in a short period of time. The longer the batter sits, the fewer bubbles there are left when it’s time to cook, increasing the likelihood of flat flapjacks. At first we thought we could add a bit more baking powder to the batter to provide some extra lift, but this merely lent an unpleasant chemical taste to the pancakes. Next, we tried adding a stiffly beaten egg white to the batter. The resulting pancakes were not quite as fluffy as those from fresh batter, but the egg white added a good amount of height. So the next time you find yourself with pancake batter past its prime, simply add a stiffly beaten egg white. Heat the Pan Properly. The best way to determine when the skillet is ready is to make a test pancake the size of a half-dollar (use 1 tablespoon of batter). If after one minute the pancake is golden brown, the pan is ready. If the bottom of the pancake remains blond—or is close to burning—adjust the heat accordingly. Serve as Soon as Possible. We tried several methods to determine how to hold pancakes before serving, from stacking up the pancakes on a heated plate, to covering them with foil, or to placing the plate of stacked pancakes in a warm oven. All of these methods did the job as far as keeping the pancakes warm. Even by the last batch of pancakes, the temperature reading would hit somewhere between 145 and 150 degrees. But these pancakes were compressed from being stacked, and they steamed from the heat and became very rubbery. What we found that the best method was to spread the pancakes on a large cooling rack placed on a sheet pan (be sure to spray the cooling rack well with vegetable cooking spray and save yourself from sticking pancakes). Place the pan and the rack in a 200-degree oven and place your pancakes on the rack in a single layer, uncovered, for up to 20 minutes (or be warned-they will start to dry out.) The warm oven keeps the pancakes hot enough to melt a pat of butter, and leaving the pancakes uncovered keeps them from becoming soggy. Pancakes with baby crabs, anyone? Summer is here, and for those of us who are lucky enough to have a bbq grill, (or for NYers, a place to grill outdoors that is not a communal bbq grill), OR a stovetop grill (like the one that almost burned down my kitchen), it's time to learn how to grill the perfect burger. 1. The type of meat in the patty is important. Do not use extra-lean meat. Instead look for meat that is 80 percent meat and 20 percent fat. The ideal size for a burger patty is 6 ounces. 2. When forming the patty, make an indent with your thumb in the middle. This will ensure that the meat plumps nicely. Flatten the patty before placing on the grill. Never press down on the patty or flatten it while cooking. This will release the precious juices that are essential to a burger's flavor. 4. Only flip the burgers one time. To form a good crust, set the patty on the grill and leave it alone for several minutes. Over high heat, a burger usually cooks in about four minutes per side. 5. Properly melt the cheese. There is nothing worse than a burger with half melted cheese. Trap the heat by closing the grill over the patties. If cooking indoors, place a metal bowl over the burgers to melt the cheese. 6. Don't overlook the rolls. Ideally, the rolls should be soft and chewy with a light toast. There are tons of rules when it comes to food plating. Here are some that I, as an amateur cook and food plater, find very helpful. When plating meat that is cooked dry, sauce goes on bottom. When the meat is cooked via braising or some other form of liquid cookery (my new favorite word. I don’t know if it is a real word, though), the sauce gets spooned on top. Play with color, texture, and height. White plates are best. They really allow the colors of the food to pop. Thomas Keller (chef and mastermind behind Per Se in NY and French Laundry is California) is probably the best plater around. Everything is pristine. Not that I would know from personal experience, but I’ve seen pictures, so that makes me an expert. :) Wow. I thought yesterday’s Top Chef Challenge was pretty interesting. For the Quickfire Challenge, each “cheftestant” (I’d like to think that I just made up that word, but I don’t think I’m that creative. I’m sure I’ve heard it a million times before) had to properly butcher a tomahawk steak and cook it to the medium rare request of chef Rick Tramonto (p.s.- Love that Spike called him out for having frozen scallops in his walk-in. Stupid, yes, but did you love it or did you LOVE it?). I’m just learning the techniques regarding a propery cooked piece of meat, and my two favorites are properly searing the meat and the rule of thumb flesh. You read that right. Heat a thin coat of oil until it gets very hot. This helps get a good surface between the meat and the pan, and it provides a nice caramelization of the meat. Many recipes call for olive oil, but peanut oil is also a fantastic oil to use for searing due to it’s high smoking point (the temperature to which an oil can be heated before it smokes and discolors—indications of decomposition, and fire (see previous post). Most importantly, don’t crowd the pan. This ensures even cooking. It also prevents the meat from steaming inside instead of searing (resulting in uneven, overcooked meat). And don’t touch it! Allow each side to sit for a few minutes to get a nice crust. Once the meat releases from the pan, it is time to flip it! Once you’ve seared all sides of the meat, you’re ready to transfer the meat to your braise, roast, or continue with whatever cooking method your dish calls for. Finally, let the meat rest. It allows the juices, which have concentrated in the center during cooking, redistribute throughout. This is so handy, but I don’t think I’ve quite mastered it yet. Rare: Touch your thumb and forefinger together and feel the fleshy part below the thumb — it will feel soft and a little bouncy. Medium: Touch your thumb and middle finger and press the fleshy part. There is a little give and it springs to the touch. Well done: Touch your thumb and little finger together and press on the fleshy part. There is no give and it is firm. I’m not going to lie, quite often, I still have to cut the meat and see how red it is. Which is very bad- it leads to the “bullseye effect”- red meat in the center, grey meat surrounding it. But I’m getting better with this.